Germany’s seventh largest city and capital of the state of Rhine-Westphalia, Düsseldorf known is a fashion capital and is a popular business and conference destination. The city is divided by the Rhine River, with the old town (Altstadt) and most of the population living on the east bank, while the commercial center is on the west bank. Running in Düsseldorf is pleasure, with lovely parks and paths anchored by the river, and more pastoral areas right nearby. As a relatively compact city, the best places to run in Düsseldorf are somewhat overlapping. The signature runs revolve around paths the Rhine river paths, and the Hoftgarten and Rheinpark that are adjacent to the Altstadt and some of the city’s main shopping streets. There’s also nice waterside running in continually improving harbor area. Südpark is Düsseldorf’s largest park and very popular for running. For neighborhoods, we like Gerresheim and **. For some hills and trails near the city, head to the forest trails of Grafenberger Wald and Aaper Wald. Like most German cities, Düsseldorf has excellent transport, a combination of local subway (U-bahn) and longer distance (S-bahn) trails, plus a complement of buses and trams/trolleys. Climate is moderate, with cool winters and warm summers. Classic European river run with paths on both the east and west sides, with bridges that allow for loops of various distances. The most popular 'loop' is the 9.2 km between the Rheinkniebrücke (bridge) and Theodor-Heuss-Brücke. 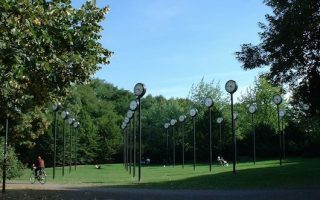 A wonderful tour of Düsseldorf's centrally located, iconic parks. 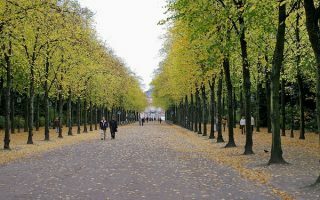 Hofgarten is the oldest park in the city, and has classic tree-lined alleés and landscaping. 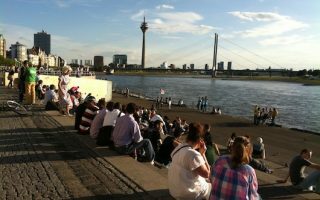 Rhein Park is very popular with joggers. It's 3.3 km one-way, combining both parks. 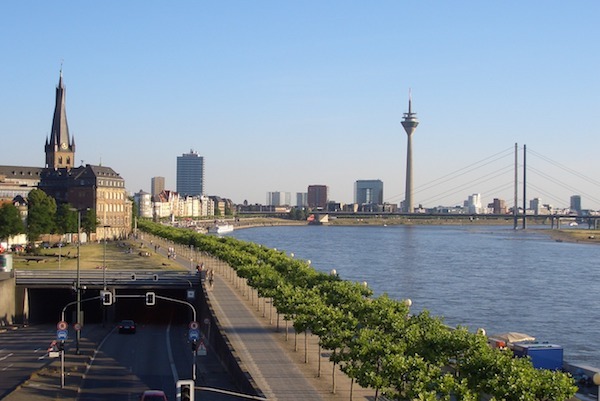 A 6.5 km (4.1 mile) 'runseeing' tour of important Düsseldorf landmarks and sights. 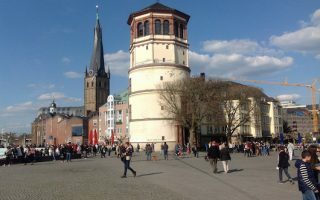 Museums, government buildings, monuments, and parks, the Rheinkniebrücke, and Königsstraß. All in a compact area on the east side of the Rhine, around Altstadt. Düsseldorf's ever-evolving harbor has a mix of some lovely sections for running, with great paths and water views, interesting architecture, and some industrial & construction areas. We've put together a 9 km loop, with options for longer or shorter. Düsseldorf's largest and most visited park, comprising three sections. Nice variety of water, meadows, landscaped gardens, and historic paths. 5.5 km route, with optional Univ. of Düsseldorf & Botanical Garden add-on. 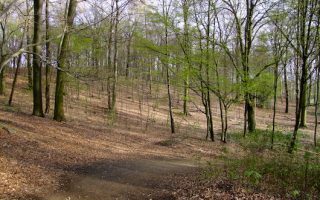 Series of forest parks just west of the city, combining Grafenberger Wald and Aaper Wald. Nice variety of easy to moderate trail running, and some hills. Our loop of 8.4 km uses the four main trails. Map has a 6.8 km jogging trail in Aaper Wald. 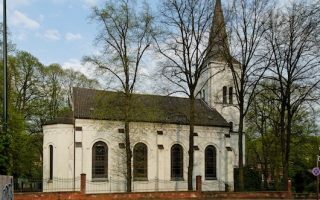 Only 7 km west of Düsseldorf and accessible by transport, this is a nice opportunity to see a quaint village and run on some more rural roads and trails, through farmland and woods. The route is inspired by Keith Hauser of joggingroutes.org. There's some decent running near the airport if you're staying at one of the hotels there. We recommend the pretty paths around the two lakes Silbersee and Grüner See, and paths through a linear park across Broichhofstraße. 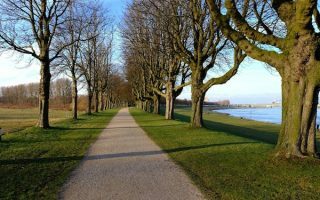 Good running options in the area on the western part of the Rhine across from Düsseldorf are the 3+ km of paths in the Rheinpark along the river, trails around Galopprennbahn Neuss sports complex, and around the Stadtgarten park. 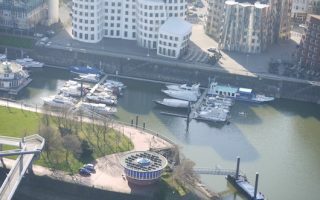 Düsseldorf has cool winters and mild to warm summers. Average summer high temperatures are in the 24C range (75F), with cool-ish nights (15-16C, 57F). Winters average in the 40s by day (6C) and near freezing at night. Snowfall is not frequent. The 800 mm (31 inches) of rain falls relatively evenly throughout the year. Typical of many European cities at that latitude, summer days are long, averaging near 22:00 sunsets at the peak, countered by those short winter days. Bunert, located near Rheinpark, is a great store with wonderful selection, group runs, a running school, and trips! More info. 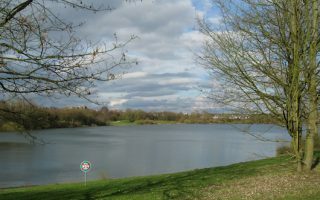 Runners Point has three locations in Düsseldorf, one near Hoftgarten, and the other in the southern part of the city, off Bachstraße, and in Neuss. Run club info. There are also outlets of Asics, New Balance, and Brooks.